This is the intercom setup as successfully tested at the Waste Management Crystal Lake Transfer Station for the purpose of elminating the need to have a person assigned to route incoming trucks. 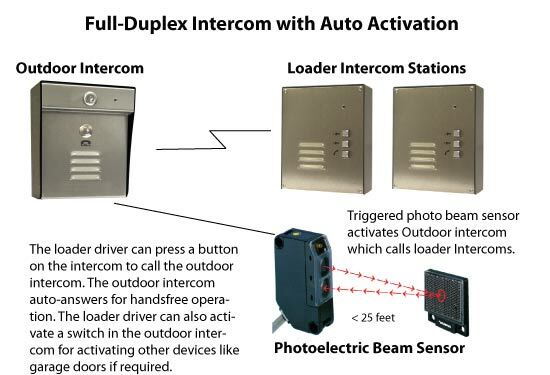 This intercom kit includes the basic items needed to configure two loaders with indoor intercoms, and one outdoor truck station. Both the indoor and outdoor intercom units have been modified with increased volume levels for the noisy locations they operate in. When trucks activate a photoelectric beam sensor, the unit automatically makes a call to the loader. The outdoor unit has been modified with an auto-answer feature so the loader driver can then press a button on the unit inside his cab, which activates the auto-answer feature on the intercom by the truck. Therefore the driver can speak into the outdoor unit totally handsfree with no button presses required. In the Related Products and Accessories to the right you will also see other components you may need for a system. Since the truck cab height varies between 76 inches for smaller trucks and 89 inches for larger trucks, it was found that placing the intercom at 72 inches high worked out well. There is a 72 inch pole or you can mount shorter poles on top of concrete pads to reach that height. If you need solar power there are two options available for the outside unit. If you are in a very sunny location like California or Arizona, you may be able to get by on the 30-Watt unit. The Crystal Lake Transfer Station in Illinois has between 200 to 300 trucks a day and is using the 50-Watt system. They have not had any power problems with it. The more trucks you have coming in daily, the more power will be used. You can also power the outside unit from any 12-24 volt AC or DC power supply. There is one in the Related Products and Accessories that you can use. The units in the loaders are powered through an included 12 volt DC cigarette lighter, or they could be wired directly into the loaders electrical system. If you want the outdoor intercom to automatically call the loaders, you will need to purchase the Industrial Grade Reflective Photo Sensor. It is powered by 12 volts so you can use the same power supply as used for the intercoms. It has a range of up to 25 feet so the reflector must be placed opposite the truck path and it should be placed high enough so the wheels don't activate it twice. This Full Duplex Wireless Gate Intercom provides crystal clear two-way audio communication with simultaneous talk and listen, just like a telephone conversation. It has a direct line of sight range of up to 4,000 feet. Its full duplex speakerphone capability has background noise immunity so when noisy trucks or other vehicles pull up to it, clear voice communication can still take place. The unit has dual built-in switch relays that can be used for remotely controlling the gates or other devices from the inside base station intercom. There is also an optional input for a Request-to-Exit button or vehicle loop detector that can open the gate when activated. Another input can be used for "auto calling" the inside station when a vehicle loop detector or motion detector detects someone arriving at the intercom. The intercoms have excellent interference immunity from other wireless devices. Their wire-free installation avoids costly trenching and they are designed to easily utilize solar panels for power in remote applications. Multiple units can be used to comprise a single system, which is ideal for large facilities. The "Call" Switch connections on the Outside unit are used to connect a motion or photo beam sensor. When the sensor is tripped, the unit automatically goes into transmit mode. A ringing tone will sound on the Indoor unit(s) (and Outdoor) and then whichever indoor unit answers the call, the call will become private between those indoor and outdoor units. The "Exit" Switch connections are used like the Call switch, but the sensors are placed on the exit side of a door or gate. When the sensor is tripped, the Inside unit will be alerted. There are two relays or switches inside the Outdoor unit that can be used to activate a gate or door opener, turn on a light, ring a bell, or whatever you want. These are used to activate the relay. If you have multiple Outdoor units, only the relays on the unit calling in are activated. An Indoor unit can only place a call to one Outdoor unit set to Access Point Number 1, but up to 9 Outdoor units can call any number of Indoor units and the Indoor units can respond. If the "Call" button is pressed during communication, the unit will hang up. Otherwise, talk time is 4 minutes (fixed) after which the unit will hang up. Multiple outdoor and indoor units can be utilized within a facility. Robust radio communication with excellent interference immunity against cell phones, pagers and handsets.